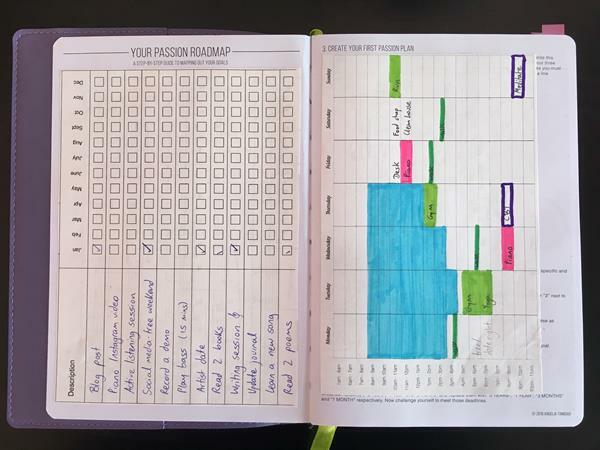 I’m a systematic planner and a stationery nerd, and after cycling through a number of annual diaries, calendars and planners, I’ve settled on one that works for me (with some personalised tweaks): the Passion Planner. 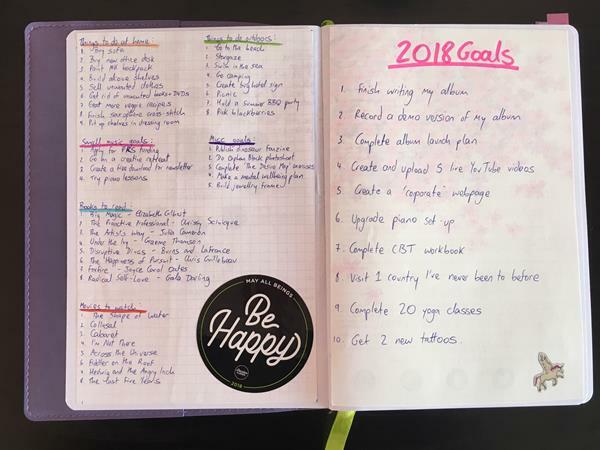 I have been drawn to the idea of a Bullet Journal for a while (the trendy diary style where you start with a blank notebook and fill in your own monthly/weekly/daily planners that best suit your needs) but it is an incredible amount of work, and requires a careful hand and pretty handwriting, neither of which I have – so using a Passion Planner with pre-filled layouts but personalising certain pages works as a compromise for me. This year I bought the compact eco version of the 2018 Passion Planner, which comes with an A5 paper booklet and a reusable faux leather sleeve in a pretty design. This year is the first they’ve offered eco editions, and I love the fact that it’s environmentally friendly, as well as how sturdy the cover is. It also holds the paper booklet in place really well, and the pages being heavy stock paper sit flatly/neatly without you having to fold and press them down, as you do with most notebooks. Another improvement on 2018’s line is that they offer an edition where the week starts on a Monday, whereas in previous years the planners always started on Sundays (I will fight anyone who insists that the week starts on a Sunday). Image 2 shows my monthly goal tracker on the left, small things I like to do each month (e.g. write a blog post). Image 2 shows my weekly plan on the right (the blue blocks are when I’m at work) – I’ve deliberately kept it sparse this year as when I’ve previously set myself weekly plans, I’ve overloaded them and then failed miserably – so the idea this year is to set an easy starting point, and get into that habit before I fill it with more. Over the page you get an annual overview for 2018 and 2019; 2019 wasn’t useful for me so I’ve covered it with “useful things to remember” (not yet completed). 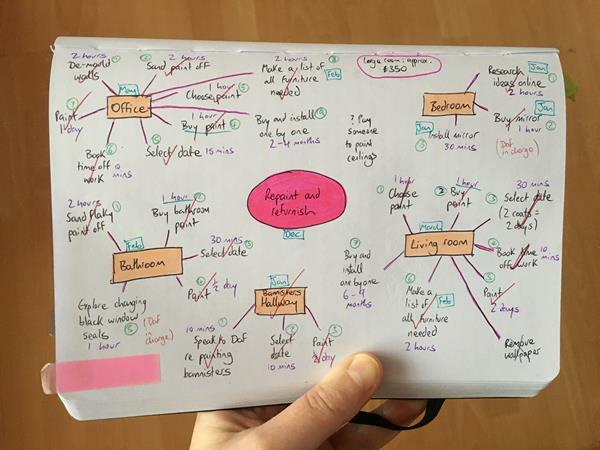 I’ve also included my colour code for the weekly layouts. 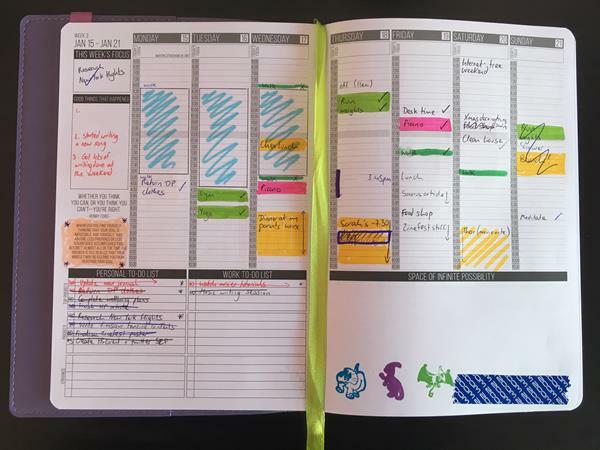 At the start of each month, you have a 2-page monthly overview calendar, with space to set a focus for the month, and 4 goals. This is a really helpful structure for me. In the calendar section, I write everything that isn’t part of my weekly plan, so this includes visiting friends, days off, date nights, birthdays, and events. 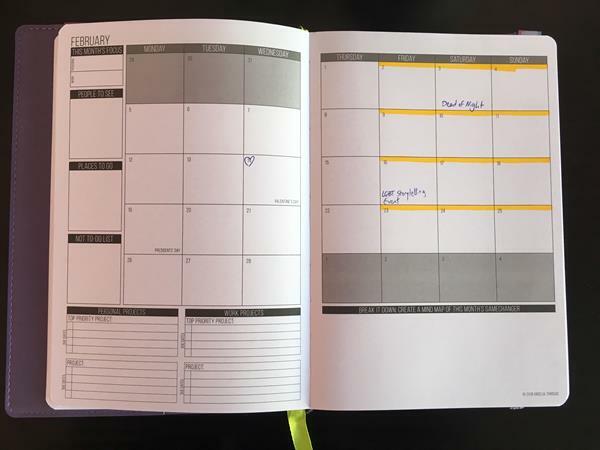 I’ve lined my days off with yellow, so I can see at a glance when I’m working and when I’m off work. I don’t use the “not to do list” because it’s almost always the same things (don’t faff about on my phone so much, don’t procrastinate), so instead I use this for tiny goals (e.g. finish writing my Sonorus article). At the end of every month, you have a monthly reflection spread with questions such as “what was the most memorable part of this past month?” and “what or who are you especially grateful for this past month?”. 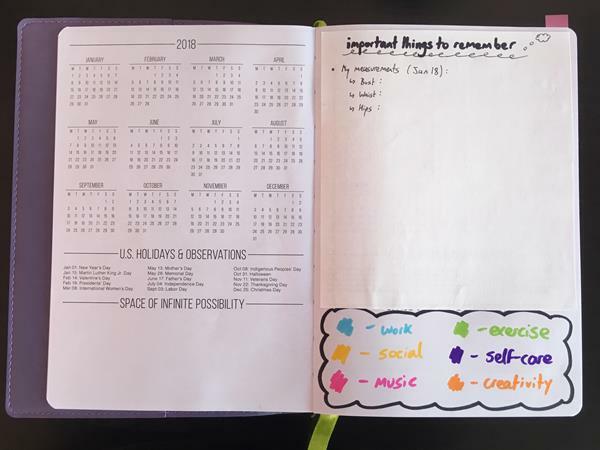 As someone who regularly keeps a diary, and has a daily gratitude habit, the monthly reflection questions don’t all work for me – so instead I use it as a place to record happy memories from the past month, to keep track of the books, films, TV, zines, and music I’ve consumed, and to reflect on how I’m acting according to this year’s intention (Divine Passion). 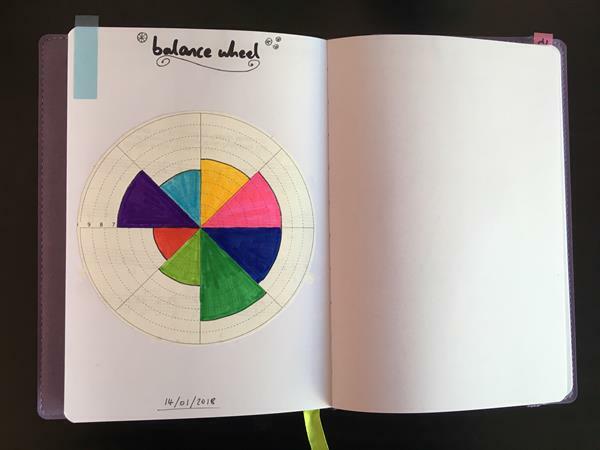 The plan is to re-review in December to see how the balance wheel has changed throughout the year. 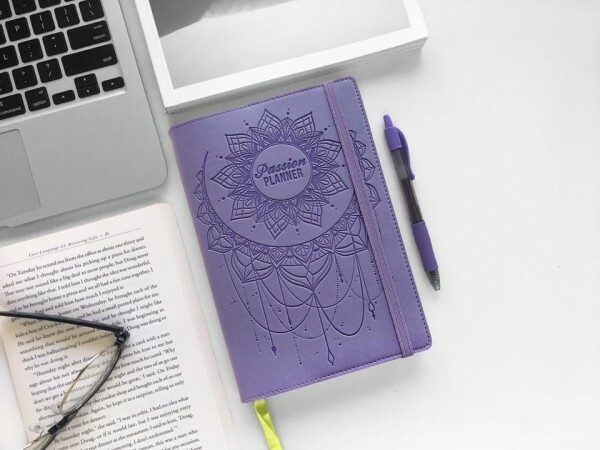 If you’re interested in planning, goal-setting, and journalling, I do recommend the Passion Planner (I should also say that this is not a sponsored post, I’m just an enthusiast)! 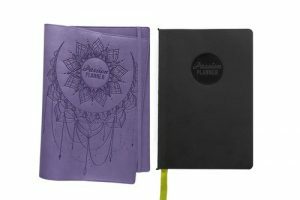 Passion Planner is also an ethical company that gives away 1 free planner for every planner they sell, and they’re owned by a queer woman of colour, which is pretty great too!